In a statement, United said the airline denied boarding to the passenger and the animal because the peacock failed to meet several guidelines, including those on weight and size. This much we know, thanks to a statement from United Airlines and a travel show called the Jet Set. But whether this was a bona fide attempt by a traveler who thought it would be okay to fly with a huge bird (inside an aircraft), let alone a species which, even according to its staunchest admirers, is a foul-tempered fowl, or whether this was a put-on, wasn't immediately clear. It wasn't so long ago that a writer for the New Yorker performed a stunt with several animals as a way of demonstrating the ridiculous extremes we've come to when it comes to accommodating support animals. But the fact that this appears to be a legitimate attempt by an ordinary traveler to take her alleged service animal onto a commercial flight points up why the time has come for airlines to tighten the rules. It's become impossible to tell the difference between outlandish stunts and people's support animals. In a statement, United said the airline denied boarding to the passenger and the animal because the peacock failed to meet several guidelines, including those on weight and size. The airline also suggested that the passenger wouldn't take no for an answer: "We explained this to the customer on three separate occasion before they arrived at the airport." The airline also noted that passengers are required to provide proper documentation from a medical professional at least 48 hours in advance of boarding that specifies the passenger's need for an animal. 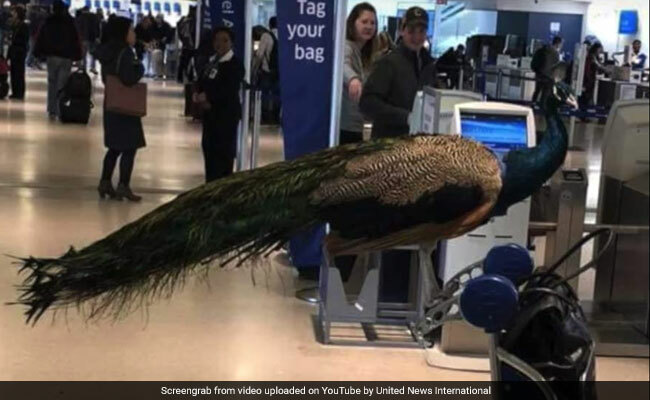 The Jet Set posted video that captures the bird's arrival at the terminal at Newark Liberty International Airport, along with photos - replete with visible bird droppings, some commenters suggest - of the grounded peacock. The talk show - which plans to air a segment soon on service animals - also says the passenger was turned down in her attempt to board the aircraft despite having bought a separate ticket for the animal. Bobby Laurie, a co-host at the Jet Set, said the photos came from a passenger at the airport who saw the United customer being denied boarding. Then another passenger supplied video of the peacock and its owner entering the terminal. Laurie, who is a former flight attendant, said he also has spoken to current flight attendants and airline staff who say the woman had tried on several previous occasions to fly with the peacock, including an attempt from JFK, and had been turned away. At Newark, the woman's ticket was refunded, and the airline even gave her cab fare back to the hotel, Laurie said. "I really think that the whole emotional-support animal thing is just getting out of hand," Laurie said in an interview Tuesday afternoon. "Granted, there are the folks out there who truly do need it, but a lot of people are now, I guess, just testing the waters to see what it is you can do and what you can get away with. As a flight attendant myself, I've had someone try to board with a pig and a turkey." In his experience, the pigs were fairly well behaved. The turkey . . . not so much. "I've actually not had a situation where we had something go terribly awry with an emotional support animal, aside from a cat. I had a cat get loose and start running through the cabin," Laurie said. "At least it was just a cat." Still, change could be in the air. United said its current policy on emotional support animals is under review.